I took this image of a lavender field in Provence, south-east France, while working on my most recent book, Full Frame. 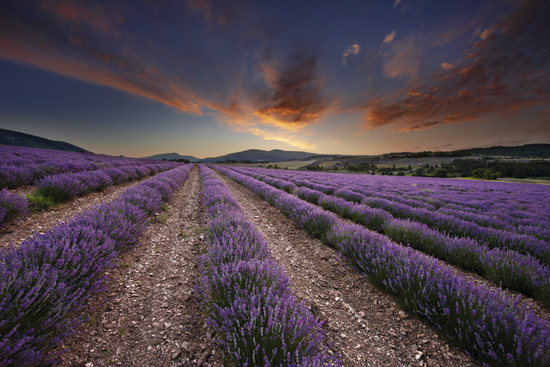 The location is a place called Sault in the Vaucluse region, an area famous for its stunning lavender fields. While landscape photography is sometimes about going out on spec with an adventurous spirit to see what you can find, perhaps to somewhere you’ve never been to before and deliberately pushing the boundaries, at other times it is about visiting a place with which you’ve developed a long-term relationship. The light and colours of the Provence region have inspired generations of artists – including me. I’ve been back to this area several summers in a row, but I never felt I’d got the lavender pictures I wanted. A cliché it may be, but the lavender is difficult to resist. The challenge, as ever, is to come up with a unique interpretation of the scene. I’ve seen many images of the lavender fields in Provence taken in very bright, intense sunlight and I wanted to see if I could come up with something a little more special and atmospheric. I used a Canon EOS-1Ds Mark III with a 16-35mm lens. When photographing lavender in Provence it’s all about finding the best possible location. Lavender fields are scattered all over this region, and I’ve spent a lot of time searching for my ‘perfect’ field. Some can look quite tatty, with weeds in between the lavender, but this one was in really good condition. One of the things I love about this image is the hills in the distance. As with many successful images, the composition is quite simple. Here the lavender lines stretch from the foreground to a vanishing point on the horizon. They converge a little more than halfway up and about a third of the way in from the left. Of course, you can shoot the converging lines of lavender until you are blue in the face, but how they fit into the image is key. Any landscape composition is about finding a way to weave various elements together to form a cohesive whole. Part of the success of this image is in the balance between the sky and the land. The converging lines of the lavender are echoed in the shape of the clouds in the sky. A cloudless sky would not have had the same impact. Photographers can’t control every event in the sky, but it is about responding to what you see in front of you and training your eye to look for elements that will help to create a strong composition. I had found this location at around noon some days before and had already worked out my ideal composition. The sun is just coming up behind the hills and this produces a beautiful light that subtly accentuates the colours of the lavender. You can see traces of golden light in the clouds reflected down onto the landscape below. If I had taken this image a few hours later, I would have been shooting directly into the sun, which would have made exposing my image very difficult. Even using a graduated filter to ensure a balanced exposure, the contrast range in the scene was just too great. On this occasion I shot two frames – one for the sky and the other for the land – and blended them together afterwards in Photoshop. This is one of those images that required a good depth of field throughout the scene. In this case, I would have looked at the nearest subject, which is the lavender at the bottom of the frame, calculated the hyperfocal distance and depth of field I would need to ensure front-to-back sharpness, and then manually focused the lens on that point. The pursuit of harmony in a picture is often instinctive and comes from spending time looking at a scene and exploring the different compositional possibilities. In terms of framing, there were a few things I had to think about. Going too wide would have over-accentuated the lines leading into the image, but going in tighter using a longer lens would have made a feature of the distant mountains. This would have been an entirely different picture. I had to balance these two extremes to ensure everything had its place in the composition. If I had chosen a lower shooting angle, this would have given more emphasis to the individual lavender plants and the diagonal lines would have had less impact. As ever, there are myriad compositions – it’s a case of realising your personal vision when at a location. I wanted this image to be about the sweeping motion of the lavender lines rather than the individual lavender plants. The use of leading lines is a popular compositional technique, but it requires a careful eye if it is to be used effectively. It’s not a case of thinking, ‘Right, today I’m going to use leading lines in my image.’ But if the opportunity arises, working them into a composition is something you may like to explore. On this occasion, it seemed appropriate to do so.